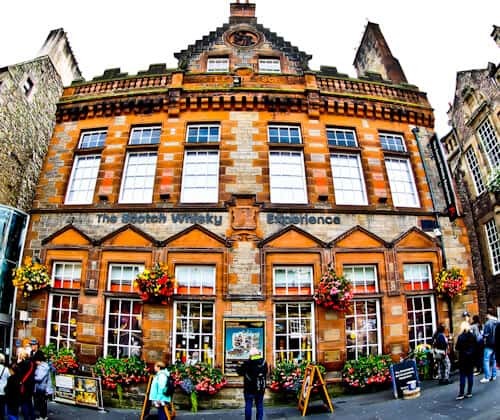 Whilst in Edinburgh you must try the Scotch Whisky and the Scotch Whisky Experience is the best location to do that. I wanted to view and photograph the largest private collection of Scotch whisky in the world and learn about whisky. My guide on the morning masterclass was Thomas, who is very educated and has a degree in brewing and distilling. Thomas also tastes Scotch whisky in his spare time so is very knowledgeable on any question you throw at him. Whichever guide you get on the tour, rest assured they’re all very knowledgeable about Scotch whisky so you’ll be in safe hands. The Scotch Whisky Experience is located in a unique building located close to Edinburgh Castle on the Royal Mile. It’s an experience in itself just to go inside a building like this! As you go inside for your Morning Masterclass you’ll be greeted by your guide and may order your desired hot drink for later in the tour. 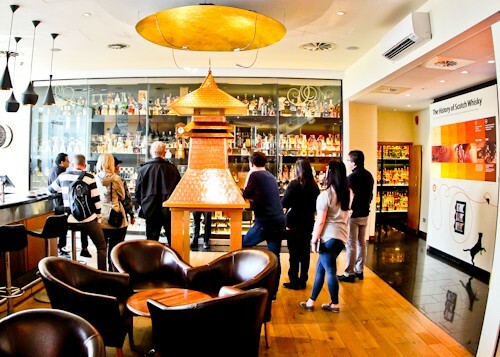 As part of the Morning Masterclass you enjoy an extended viewing of the largest private collection of Scotch whisky in the world. Thomas will explain about the different whiskies and distilling processes. He will point out a few of the more interesting bottles in the collection and explain a few interesting facts about them. The drink you ordered earlier should arrive during the introduction and you may now view the collection with your drink and shortbread. As the group was moving onto the next stage I asked Thomas if I could take more pictures of the collection. He was very happy for me to stay behind in the room to photograph the collection. As I was alone with the collection I was able to take many Instagram worthy images without waiting for anyone to move out of the way. During my experience of the Morning Masterclass, the extended viewing of the whisky collection became a private viewing – which is priceless. Thomas will point out a few of the unique whisky bottles that have been made for special occasions and promotions. If you see a particular bottle that grabs your interest then Thomas will be happy to explain its purpose. After viewing the unique and collectible whiskies you will then take a sensory perception test. You may be thinking what is this and why is this part of the Morning Masterclass? 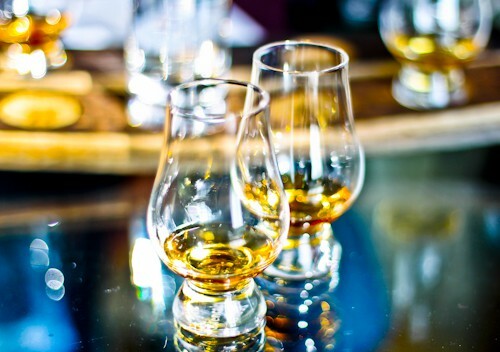 As part of the whisky tasting you use your nose to identify the flavors which is called nosing. The sensory test will prepare you for the tasting and enhance your experience. You are given 10 different scents to identify such as vanilla, cinnamon, peat etc.. afterwards you will be awarded a score out of 20. I shamefully scored 2 out of 20 but some other members of the class scored quite well. After you have taken the sensory perception test you will be ready to nose and taste the whisky. You will have 5 whisky samples ready to taste. Among the 5 there will be a blend, a single grain and a single malt. Thomas will explain each whisky you are tasting and show you each bottle as you go through the 5. Thomas will teach you methods on how to work out the maturity and taste of the whisky. Methods such as checking the color and viscosity of the whisky. About what these indicate regarding maturity and taste. Following these tests you nose the whisky to check for scents you learnt in the sensory perception test. After the visual and scent test you then check the taste of the whisky. Even regular whisky drinkers will learn a lot about whisky during the whisky tasting. 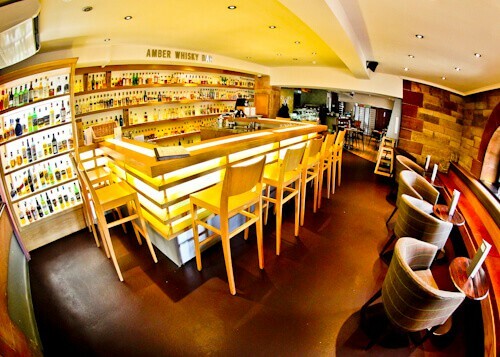 If you still have an appetite for whisky after the tour then you can visit the on site bar, of which there are 2. If you let the barman know you have been on the Morning Masterclass then you’ll get a discount on the drinks. Of course the barman is a whisky expert too and will help you find your desired whisky. After you have completed the Morning Masterclass you have the option to take the whisky barrel ride. 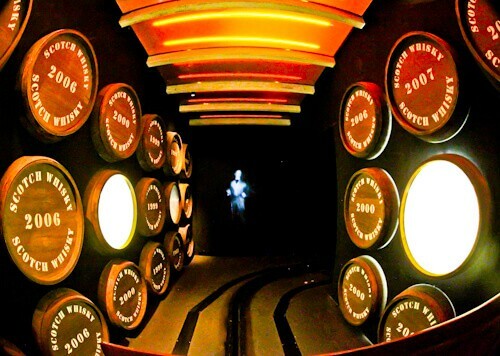 This ride takes you through the process of making whisky all guided by a ghost! After you’ve taken the morning master class I would recommend visiting the store. With everything you’ve learnt in the class you’ll now be able to find the perfect bottle of whisky for you or for a gift. The staff in the store are experts in whisky so you can ask for recommendations in your favorite whisky characteristics. 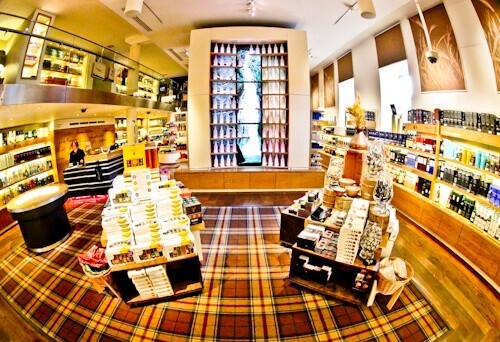 There are lot of whiskies in this store that you will not find in your local store back home so you can find pretty unique gifts here. Visiting Edinburgh? Check out these Edinburgh Landmarks. Additionally, visit Tynecastle Park football stadium and Murrayfield, the largest stadium in Scotland. I collect interesting whiskey and wine bottles, so viewing of the unique whisky bottle collection appeals to me. Though wine tours are more popular, I am glad to read about the whiskey tour. I would like to add some of these in my collection. I actually done this tour many years ago, and it’s so much fun! I didn’t do the whisky barrel ride with the ghosts, so maybe I need to go back. Shame on you James for scoring 2 out of 20! Maybe I can score higher in the private viewing with the whiskeys! I must show this post to my husband as he would love to read each and every details of this post and also like to visit this place. Building of Scotch Whisky Experience is so marvellous and also the interiors are lavish with rare and expensive collection of whiskies. Morning masterclass must be fun and learning too as knowing what is single malt and double malt. Whisky Barrel Ride is funny because guided by ghost. I would definitely love to visit the Whisky Experience for one simple reason: I don’t like whisky! Funny and strange reason, right? I might be drinking it the wrong way, maybe a I never knew the right way of tasting it, to get to like it. So this experience might show me different. I love the idea of the Barrel tour, guided by a ghost. Wow, my husband would LOVE this! His fave is an Irish whisky called Kilbeggan but the Scottish stuff is top! Were you any good at identifying the ‘notes’ in the whisky? I can barely identify spices in a curry so think I’d be rubbish!! Edinburgh looks beautiful, gorgeous architecture. That is quite a unique experience to try when in Edinburgh! I didn’t know that the city is known for its Scotch whiskey! But that is sure a must-try tour for those who are into this! The bar and the building itself is also a treat! Since I’m not an avid drinker I still love the ambiance of this Whiskey Tour. If I ever go to Edinburg I will definitely have someone to accompany me on this tour! Haha! 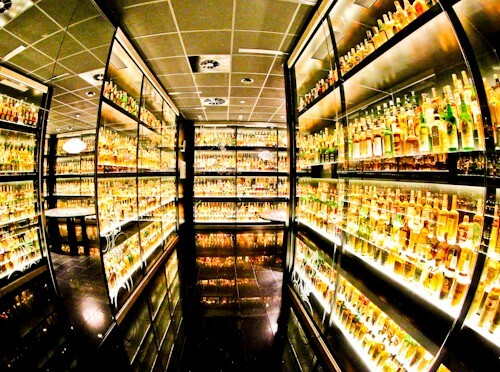 I don’t drink alcohol but would love to take a tour to see the collection, it looks so cool. As always I love your pictures and the way you describe everything in detail. Although I’m a non alcoholic but I’m admitting I’m intrigued by your captures here. I love the building capture, assuming it’s bar you’ve mentioned here and it looks superb to me 🙂 Forwarding this post to my friend who enjoy whiskey!! I loved this experience. Totally!!! Esp that room filled with the largest collection of Scotch Whisky bottles was just mind blowing. Esp the ones which were mostly evaporated with angel’s share were really intriguing. I really wished I could taste those very old ones! Those human sculpture shaped whisky containers were impressive too. Glad you enjoyed it and good that Thomas also stayed back with you to take a few more shots!!! Definitely not an alcoholic beverage drinker, but I love the building that it’s in! The collection itself is really impressive, and I have to say that the bottles and specialty bottles are beautiful. What a way to dive into local culture and history! I was in Scotland and Edinburgh about a year ago. I absolutely loved visiting this place. I actually went with my two younger girls so did not select this particular experience. I loved that they were kid friendly and the ride was quite fun for them and educational for me. And they do a fantastic job explaining the process and allowing you to try some samples. Next time I am in town I must upgrade the experience. Even though I don’t drink whiskey, I would still visit this place just to see the building and unique bottles. Wonderful photos! This looks like a fun thing to experience in Edinburgh! Even though I am not a drinker, it would be fun to learn about whiskey! That whiskey barrel ride seems quite educational! Whiskey tour sounds so much different from the usual wine tours. There is a mechanism and process to everything and I love to know about these things. IT would be great to attend one such tour to learn about whiskey though I don’t plan to drink.